Gaga Games, a developer which is known for the popular idle clicker Merge Plane, is back with a new title under the same genre for iOS device owners, and it’s called Idle Capitalist, or The Big Capitalist 3 if you are on Android. This particular title is closer in terms of mechanics and gameplay to games like AdVenture Capitalist (arguably the game that started it all), and it places you, at first, at the very bottom, starting a lemon juice business (or lemonade stand, if you may), then moving on to bigger and more lucrative businesses while expanding the ones you currently have. You’ll also get to simplify the day-to-day operations of your businesses by hiring managers, as well as moving on to new worlds where you can replicate your achievements in the default setting by opening and growing even more businesses. You’ll get all this, as well as some interesting graphics reminiscent of Seth MacFarlane’s work for Family Guy, American Dad, and other series. This is a point we’ll be making in a bit, but you may think that this game is a walk in the park, especially if you’re a veteran of the AdVenture Capitalist scene. However, every idle clicker is, in one way or another, different from other titles in the genre. 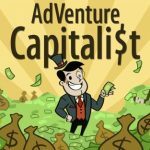 We’ve put together a list of tips and tricks that cover all the aspects of the game and are designed to help you earn money faster and more efficiently, so read on and check out our Idle Capitalist guide, for tips, cheats and strategies, regardless whether you’re a beginner, or even an experienced player who’s been earning in-game money for quite some time! 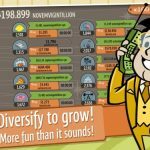 If you’ve played AdVenture Capitalist, or any one of the many similar idle clickers that followed in its wake, you’ll probably have little time figuring things out in Idle Capitalist. However, you also may be a newcomer to the world of idle clickers, which is why we’ve made sure to include this tip and get you started on the road to earning more than just trillions in dollars…at least in this in-game universe, that is. When starting out the game for the first time, you’ll bee asked to start a “Lemon Juice” business — this is, obviously, the equivalent of the lemonade stand you start out with in the aforementioned AdVenture Capitalist. At this point, you’ll need to tap on the screen in order to earn more money. Just keep on tapping, and when you can afford, it tap on the orange button underneath the Lemon Juice window to expand your business in order to earn more profit per tap. You may also be able to open a new business (Poultry Farming) at this point. Keep on doing this until the game prompts you to purchase your first Manager, this time for Lemon Juice. Hiring a Manager for your business allows you to automate it, thus eliminating the need to tap on the screen to earn. You may also be prompted whenever you can afford an upgrade to your businesses’ profitability (normally a x3 multiplier), and you can take care of this by tapping on Menu, then on Upgrades. This will be how it goes until you reach the final business in the default (Modern Times) world, which is your Jewelry Shop business. Purchase new business, go to Managers to hire a manager for that new business, tap on Expand when you can afford it, upgrade your businesses, rinse and repeat. There’s really nothing to it if you consider the basic mechanics of Idle Capitalist, but of course, you’ll need to learn a few tips and tricks in order to earn that money faster, move on to other worlds, and “prestige” faster — we will explain this term later on in the guide, so keep on reading as we tell you more about this game and how to play it! 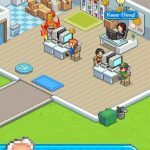 When playing idle clickers, you want to maximize the “idle” side of things, which means fewer things to do and fewer reasons to tap on your screen for one reason or another. One way to do this is to tap on the Expand By button on the upper right corner of the screen. This controls the number of levels you increase each business by whenever you tap on the Expand button — aside from the default “Expand by x1” option, you can choose x10 to level up by increments of ten, x100 to level up by increments of 100, or xMax to level up by as many levels as your money can afford. Choosing the latter option may sound like the fastest and easiest way to go, but this also will leave you without any money to spend for your other businesses after you’ve used it the first time. We recommend the “x10” option as the usual setting, once you’ve earned about a billion dollars or so, while leveling up one level at a time for your higher-level businesses, especially if you’ve just unlocked them for the first time. Aside from the money you earn through your various businesses, there are various ways in which you could earn some bonus cash. The fastest way to do so, at least as far as earning extra cash without watching videos is concerned, is to tap on the flying dog which may appear on your screen from time to time while playing the game. This will allow you to instantly add to your cash balance, and while it may not be much compared to the other bonuses you could earn as you go along, it never hurts to get free cash in such an easy and convenient way. On the right side of your screen, you will see several buttons, including the Skip button. By tapping on this button, you will be given several options that would simulate the effect of going offline for a certain period of time and earning offline cash over that timeframe. The simplest option would be to skip 30 minutes, which would only require you to watch a 30-second (or shorter) advertisement video. You can also choose to skip longer periods of time (one day, seven days, 14 days), though this will require you to spend some gold bars, which are the game’s premium currency. We would only recommend these options if you will really be away from the game for an extended period of time (with a lot of gold bars stashed away, might we add), because it’s just not worth it to drop some premium currency on something, but not get the best possible value for it. This one’s pretty simple, but we’re sharing it anyway because of how important it can be if you’re trying to earn more money sooner rather than later. It should go without saying that the game allows you to earn cash while you’re away, and that you could add to your balance quite significantly when you’re opening up Idle Capitalist for the first time after you wake up in the morning (or whenever you normally wake up). However, you can double the amount of offline cash you earn by watching an ad video — make sure not to exit out from the video in order to successfully double your earnings! Additionally, you can spend five gold bars in order to quintuple your offline earnings, though this isn’t normally advisable unless you’ve got a lot of gold and have been away from the game for a while. In addition to watching videos to double offline cash, you can also use it after tapping on the Speed Up button on the left side of your screen. This reduces the time it takes for each business to earn revenue, and you can get four hours of speed-up time by watching one video, or by paying five gold bars. Like in the above scenario, it would normally be better if you hold on to your gold rather than spend it on four hours of an x2 speed-up. The Challenges button is the first of several you will see on the left side of your screen, and in here, you will see two ways in which you could open up the Tycoon Chest — To Be Rich and Daily Challenge. 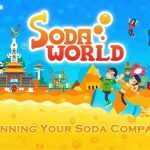 The former section refers to tasks which you can accomplish without any definite deadline, and represent part of your ongoing goal to keep earning money in the game as its titular Idle Capitalist. Completing these tasks could earn you Medals for the Quests (more on them below), gold bars, Gold Tickets, and/or Cash Express, and you can earn even more of these rewards once you’ve accumulated enough points to open up the Tycoon Chest! The Daily Challenge, meanwhile, refers to tasks where you only have within the day to complete, and since there is an element of time pressure here, you will naturally get more points (5, as to only one for To Be Rich) if you’re able to complete what is asked of you. The tasks you have to complete for both To Be Rich and Daily Challenge are all part of the natural process of playing the game, so there really isn’t anything special that you need to do. You can, however, go back and refer to the challenges in question in order for you to have a good idea on what to focus on and how long you need to be actively playing the game within the day. Also, the Challenges button features a Time Chest next to the Tycoon Chest, which you can open every four hours — don’t expect much here (usually, you’ll be getting some bonus cash), but keep on opening Time Chests on a regular basis and the rewards can add up. Quests, which are found by tapping on the second-to-top button in the left, may sound similar to Challenges, but the difference here is that you’ll need to accumulate the stated number of points in order to get the ultimate “profit bonuses” promised. These would require you to reach a certain level for a specific business/all of your businesses combined, so it’s all about leveling up here in order to get boosts to either the speed in which you earn money or the amount of profit you earn per business. Idle Capitalist also comes with a few daily bonuses that can come in handy as far as earning more cash and other resources is concerned. For one, the game comes with the standard daily login bonuses that are often included in other titles, regardless of genre — the bonuses here could range from Gold Tickets to Cash Express to gold bars, and the seven-day bonus is a one-day time skip and four Gold Tickets. Fortunately for those who don’t play the game on a daily business, the bonuses do not reset in the event you miss one day of gameplay. That means you can move from Day 3 to Day 4, for instance, even if you miss a day or two (or more) in between. In addition, you can take a free spin at the daily wheel (among the buttons on the left side of your screen) and have a chance to win one of several types of freebies, including the ones we mentioned above. (cash, Gold Tickets, Cash Express, etc.) You’ll need to watch a video in order to take advantage of the free spin — this, we admit, sounds like a bit of an inconvenience, but then again, it’s just 30 seconds or less. Subsequent spins in a day will cost you $2, though as we’ve seen, this allows for the prizes to become “10x better,” as the game claims. That could mean rewards of up to 70 gold bars if you’re lucky…and willing to part with $2 in real-world currency! 9. How Do Cash Express And Gold Tickets Work? You’ve seen us mention Cash Express and Gold Tickets multiple times in the preceding tips, and you’re certainly wondering by now what these two resources can do for you in Idle Capitalist. Let’s start out with Cash Express, which is as simple to use as tapping on the Cash Express button on the left side of your screen. As the name suggests, Cash Express is instant cash, and once you tap on the left-side button we mentioned above, the cash — which comes in random, though fairly generous amounts — gets automatically added to your balance. This is important, because Cash Express can only be applied to a balance specific to the world you’re currently in. There isn’t much to this resource, but as you can see, it’s a great way to substantially add to your fortune. Gold Tickets, on the other hand, can be used to significantly, and permanently multiply your profit across all businesses, or also to instantly add a ton of cash to your balance. Aside from getting them by completing challenges, spinning the wheel, or collecting your daily login rewards, you can exchange gold bars to get a few. You can also use them to unlock the Old West world under Adventures, though that’s going to cost you a whopping 100 Gold Tickets — if you want to run businesses in three, instead of the usual two worlds, we would advise you to save those Gold Tickets, because 100 is definitely a lot in the grand scheme of things! The globe button on the bottom of the screen allows you to unlock new worlds, or as the game calls them, “Adventures.” While you may already be earning a lot of cash in the default Modern Times adventure, you can always spend that cash you earned to unlock the Ancient Times adventure, which works exactly the same way as Modern Times, only with different types of businesses. As we mentioned earlier, Old West can only be unlocked if you have 100 Gold Tickets on hand, but for most players, two worlds/adventures should be more than enough to keep you busy. In addition to the different adventures, Idle Capitalist also comes with limited-time events, which can also be accessed by tapping on the globe button. The Events tab is right beside Adventures, so be sure to check back regularly for schedules, as well as whenever the event is scheduled to go live! Like any mobile game worth its salt should, Idle Capitalist comes with an in-game shop, which you can find on the leftmost side of the bottom menu. The first thing you’ll see here are special deals for gold bars, which can be purchased through the shop by spending real-life money. But you may be most interested in the Items section, which contains different costumes for your character to wear. Keep in mind that these aren’t aesthetic-only costumes — they can actually add bonuses to your base profit, base speed, and Angel profit boosts for a given world. They are, however, rather on the expensive side, as each costume will cost you 30 Gold Tickets each! Make sure to see which world the costumes work on, because you wouldn’t want to be dropping 30 Gold Tickets on an item that only works in the Old West when you haven’t even unlocked that adventure yet! 12. Prestiging – What’s In It For You? As a primer for those who haven’t played idle clickers, or haven’t played too many of them, prestiging is the term for the process of resetting the game, effectively putting you back to square one and zeroing out whatever common resources you have earned, but hanging on to your premium resources and/or taking advantage of certain boosts that will allow you to go through the next play-through faster. In Idle Capitalist, Angels serve as an example of the latter, and the more Angels you earn (i.e. the longer you play and more money you earn), the higher your profit boost will be once you restart your game. Simply tap on the Menu button, then on Angels in order to reset your game and increase your profit multiplier, with each Angel giving you an additional 2 percent profit boost. You can also opt to increase that multiplier without resetting, though that’s going to cost you 10 gold bars at first. Last, but not the least, do keep in mind that resetting, or prestiging, is specific to the world where you perform the reset. That means the Angels you earn and the progress you reset in Modern Times will not affect, or be related to your Angels/pre-reset progress in Ancient Times. This wraps up our comprehensive guide for Idle Capitalist. We hope you’ve found our tips useful, and if you know additional tips, don’t hesitate to let us know in the comment section!